Here is a book that is one of those books that encompasses everything you would ever imagine that you would need to successfully code orthopedic procedures from the waist down. 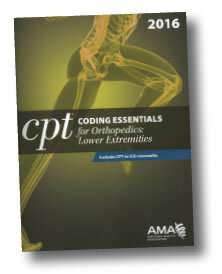 The CPT® Coding Essentials for Orthopedics: Lower Extremities 2016 follows the same type of format that the Upper Extremities and Spine edition does. There are chapters covering terminology, abbreviations, and basic anatomy, Introduction to ICD-10-CM and ICD-10-PCS, anatomy and physiology, ICD-10-CM documentation, and CPT® Procedural Coding. Each CPT® code has the official description provided, as well as the following: AMA Coding Guidelines, AMA Coding Notes, plain-English descriptions, an illustration of the procedure, ICD-9-CM diagnostic codes, ICD-10 diagnostic codes, CCI Edits, AMA CPT® Assistant information, Facility and non-facility RVUs, and modifiers. Really, how much more information on one code do you need? They really have thought of everything, which of course makes your job as a coder easier. If you code orthopedics (upper, lower, spine, etc. ), I truly believe that you will find these books a necessary part of your coding routine.